CSTC Must Run Program to improve running form for all types of runners and assist in injury prevention! The Must Run program at Community Sports and Therapy Center located within Mercer Health is a one of a kind program in our area. 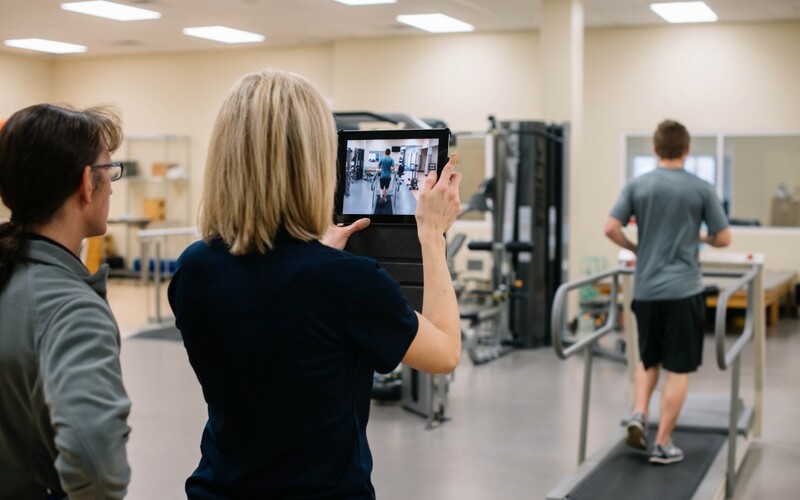 For years, athletes who have wanted to have their gait assessed or to have help in managing their running specific problems have had to drive to Dayton, Columbus, Fort Wayne or further for professional assistance. We are proud to be able to offer this high quality program locally! The Must Run program at Mercer Health is a team oriented approach where each runner’s strength, flexibility, power, and running gait are assessed by licensed professionals. The results of this evaluation are then discussed with the client and feedback given regarding opportunities for improvement through exercise, strengthening, drills, and gait cues. Each program is individually designed and tailored specifically for each person’s unique anatomy and findings. We are able to assist with injury management and prevention, return to sport following injury or layoff, as well as adjustment and progression of training. We are here to help you meet your goals and keep you doing what you love! Weakness of core musculature, hip/pelvis mal-alignment, tightness, and poor form can affect your running economy and efficiency. A structured plan and program can not only improve these specific areas but can also improve your overall performance, leading to a stronger, more efficient runner. Our therapists work together to help each participant meet their specific goals and can provide feedback regarding changes and/or adjustments to training plans to maximize performance. Video gait analysis is included and the results reviewed with each runner. This allows you to visualize exactly what is happening and how any weaknesses are affecting your gait. So who would benefit from Must Run? We work with all ages and skill levels from beginner, high school and college level athletes, masters, and even elites. Everyone can benefit from having their strength and form assessed and even better, often times very simple tweaks or additions to your program can result in big gains! Billing is done through your insurance plan, and many insurances do not even require a referral for physical therapy any more. As always we encourage you to check with your insurance provider to see what your benefits allow and if you are able to self refer. We accept prescriptions from physicians, nurse practitioners, chiropractors, and physician assistants. If your insurance does require a referral from your medical provider, a simple evaluate and treat order will work, or they can specify Eval and Treat – Must Run. Even if you do not have an injury, we are still able to bill insurance and proceed with the program as part of your plans therapy coverage. Scheduling is easy and can be done by contacting our Coldwater office at 419-678-5125. After the initial session, we work with each client to determine the best frequency of visits, whether that be weekly, bi-weekly, monthly, or even just a one time session. We are here to help and want to provide you with the best patient experience possible. Please contact our offices for any questions or concerns you might have about the Must Run program at Mercer Health. Happy Running!